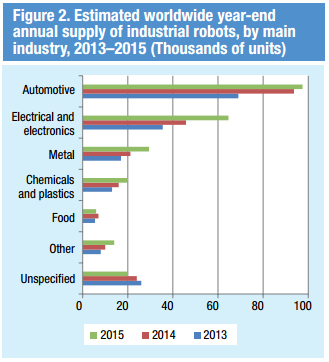 Automated industry is gathering pace in developing nations. From recent reports, it may seem like automation only affects those in developed countries. But a report from the UN Conference on Trade and Development says that it might also affect those in developing countries, likely, even more so. The report explains that, “The increased use of robots in developed countries risks eroding the traditional labor-cost advantage of developing countries.” It cites another report from the World Bank that states: “The share of occupations that could experience significant automation is actually higher in developing countries than in more advanced ones, where many of these jobs have already disappeared.” This means that low-skill jobs in developing countries are more vulnerable since these jobs could also be done by robots, thus displacing human low-skill labor in these countries. This translates to about “two thirds of all jobs” developing countries might lose to automation. It states that automation could run the risk of having economic activity, like the manufacturing industry, be reshored to developed countries from developing ones. Reshoring is the act of bringing back domestic manufacturing to a country. It is already happening today but according to the report, it’s happening in a slow pace. This, of course, brings up the issue of alleviating the impact that the robots have on the developing world. According to the report, “outcomes will be shaped by policies.” It advises these countries to embrace the “digital revolution” through the changing of educational policies combined with “supportive macroeconomic, industrial and social policies.” The report says that it might even help developing countries catch-up through the possibility to manufacture on a large scale. Another solution could be to introduce Universal Basic Income. It will and is already being debated right now as some experts in various industries are pushing for it. It is being tested now so we could only watch out for its results. “Disruptive technologies always bring a mix of benefits and risks,” the report says. We should always weigh in the risks these technologies bring while at the same time, exploring new ways to better our society with it.